1. Sir James STEWART of Schillinglaw, 6th of Traquhair, son of Sir William STEWART 2nd of Traquhair ( - ) and Christian HAY ( - ), was born circa 1534. He had the title '6th Baron of Traquhair'. He appeared in the census. He died on 9 March 1607. He married Catherine KERR. 2. Sir William STEWART 2nd of Traquhair, son of Sir James STEWART 1st of Traquhair and Catherine RUTHERFORD, had the title '2nd Baron of Traquhair'. He married Christian HAY. 4. Sir James STEWART 1st of Traquhair, son of Sir James STEWART 1st Earl of Buchan and Margaret MURRAY, was born in 1480. He had the title '1st Baron (Laird) of Traquhair'. He married Catherine RUTHERFORD on 9 November 1505. He died on 9 September 1513 in Battle of Flodden. 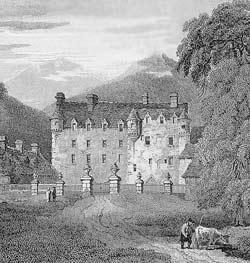 James III gave Traquair and all its lands to his favourite; Robert Lord Boyd, then a few years later to his Master of Music who in turn sold it on to the King's uncle the Earl of Buchan for the equivalent today of a few pounds. Buchan's second (illegitimate?) son, James Stuart, became the first Laird of Traquair in 1491, and it is from him that the present family is decended. Described at this time as the "turris et fortalicis de Trakware", it stood with walls averaging nearly 6 foot thick, and can still be seen at the North West corner of the house. James Stuart had plans to extend the tower, but he fell with his King at the Battle of Flodden Field in 1513. "This James, being a man of great spirit and fortitude, accompanied King James IV to the fatal field of Flowdon, where he lost his life with his royal master, anno 1513". 6. John HAY 2nd Lord Hay of Yester, son of John HAY, had the title '2nd Lord Hay of Yester'. He married Elizabeth CUNNIGHAM.